These pages represent a research project into the history of brass bands in the Province of British Columbia. This site continues to develop as information is uncovered concerning this unique musical phenomenon. Brass Bands in the Province of British Columbia were a common form of musical expression in the colonial to pre-World War 1 years. In general, the bands were comprised of two groups: those developed by the European colonists, which were primarily community bands, and those developed amongst the First Nations peoples, often in association with a religious organization. It is impossible to write the history of brass bands in British Columbia without reference to the brass band movement in Great Britain. Most of what occured in BC was imported by the colonists and missionaries. In understanding local developments there are three areas in the development of brass bands in Great Britain that require special attention: instrumentation, music and contests. In the early 1800's, flute and clarinet were chief melody instruments in village bands. For most of the 1800's, the clarinet held its place, despite the shift to all-brass instrumentation. Argument for its inclusion was that although it was a reed instrument, models in brass bands were generally made of brass. Clarinets are still playing in highly-proficient competing brass bands up until the early 1860�s. In 1860 Black Dyke still sported an Eb clarinet, while Besses had a Db clarinet. Besses o' th' Barn Band, 1860. The band includes a clarinet and an ophicleide. 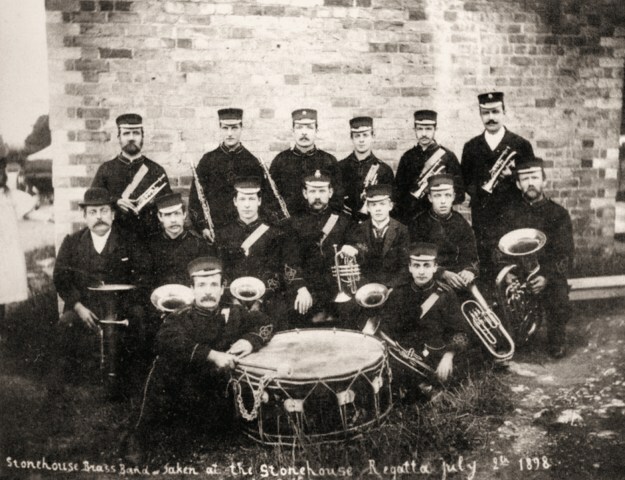 Stonehouse Brass Band Gloucestershire, 1898. The photograph clearly labels the band a brass band. However it includes two clarinets. The keyed bugle was the first instrument to mount a challenge to the clarinet. An advantage over the early trumpet in that it was able to play all the notes of the chromatic scale instead of just the harmonic series. 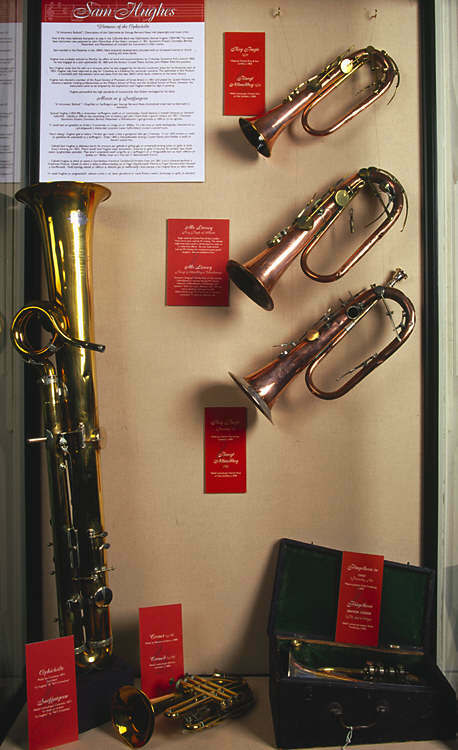 Crooks could be used to lengthen the trumpet�s tube and lower its harmonic series, but only half a dozen or so notes were available at any one time. The slide trumpet had a wider range of notes, but its degree of difficulty was such that amateur bandsmen did not take up the instrument to any great degree. The keyed bugle suffered from tonal weakness and intonation problems, which were corrected with the advent of the valve. ~1828 the cornet was invented, using three valves instead of keys. In France it was known as the cornet-�-pistons and in Britain as the cornopean. By the end of the 1840�s the cornet had replaced the keyed bugle in amateur bands. Repiano is probably a mis-spelling of the term ripieno, meaning supplementary. This part is generally used to supplement the solo line or other tenor line. In early bands horns were natural horns � without valves. Players used crooks to allow them to change the instrument�s pitch, but changing crooks was not possible during the short pieces played by amateur bands. French horns were used for only a short time in the history of brass bands, almost disappearing by the 1860�s (although Black Dyke�s instrumentation in 1860 lists a French horn). This was probably due to the fact it required a different lip technique to that of the cornet and saxhorn family. The French horn was gradually replaced by the tenor saxhorn. Tenor horns replaced the French horn in brass bands. Early scores had as many as 4 tenor horns, but, after the First World War, the standard complement of three was adopted. Flugelhorns were slow to be added to the standard banding instrumentation. While Black Dyke�s instrumentation of 1860 lists a flugelhorn, it was not standard instrumentation for most bands. 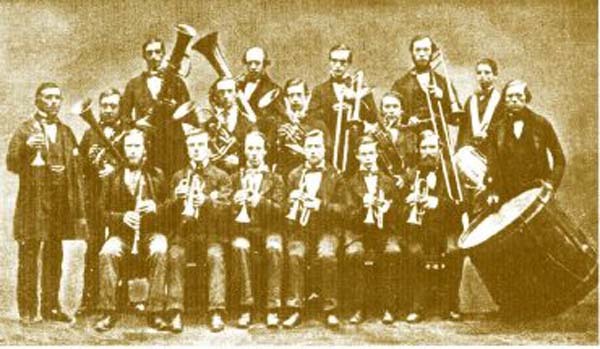 By 1870, as bands grew in size, flugelhorns became more common. In fact, some scores called for as many as three. In the early years (from about the mid 1840�s) valve trombones were popular. However, this gradually was replaced by the slide trombone. By 1873 only slide trombones are allowed at brass band contests (although this date seems to vary depending upon who you read). Alto trombones had a short existence in brass bands but two tenors and a G trombone became the norm. The ophicleide is a member of the keyed bugle family. Invented in 1817, the ophicleide was built in different lengths. It originally had nine keys, with later versions expanding to 12. The ophicleide originally replaced the serpent in village bands, and was itself replaced by the euphonium. First made by the German instrument maker Sommer, the euphonium eventually replaced the ophicleide. However, the ophicliede continues to be represented in brass bands up to the beginning of the 1900s. Initially, the bass line was occupied by the euphonium and the Eb bass. The large BBb contrabass (also called the �monstre�) was slow to be accepted into the brass band. By 1875 the bass section had standardized to two Eb and two BBb basses. Originally, bombardon was a name given to a 12-keyed ophicleide made in Vienna (1860 instrumentation shows that both Black Dyke and Besses continued to use the ophicliede). However, the name soon came to apply to tubas. Traditionally, bombardon referred to a tuba in a band, while it was called tuba in the orchestra. The �circular� bass, known as the helicon in Germany, originated in Russia, but did not last long within the brass band movement. Due to the non-standardization of instruments, music was generally published as piano or vocal scores. Manuscript arrangements and individual parts were scored for each band by that band�s leader/conductor. Early bands were composed primarily of members who �played by ear� as opposed to reading music, with a minority who could actually read music. As the movement developed eventually all band members could read music. The band leader's responsibilities included writing out band parts and then teaching the members how to read and play them. Most early band music was specifically composed for band, written in well-known and popular idioms consisting mainly of marches, dances and solos. Music for contests was based upon music from opera, a specific composer, or a collection of national/patriotic airs. Opera music is by far the most popular, with bands playing medleys, selections, overtures and solos (based on operatic arias). Full scores were slow to be accepted by brass bands. Initial attempts by Wright and Round to publish full scores met with little interest in the banding community, although many test pieces had full scores written out by hand. R. Smith and Company were the first to regularly print full scores. Printed music was slow in coming. The first printed test piece for the British Open Championships did not occur until 1866. Initially, printed music focused on shorter pieces that had more commercial appeal to a wide range of bands of varying skill levels, and hence had a larger market. By the end of the 1890s there were ~20 publishers of brass band music. Contests were the driving force for the progress of bands. It was also profitable for the better bands. Prize money would be shared amongst the band members, supplementing their income from their regular jobs. However, because they were not chiefly earning their living through playing they were deemed not professional musicians thereby adhering to their amateur status necessary for participating in brass band contests. Contests also set the standard for instrumentation. Contest organizers, in conjunction with publishers, gradually set the standards for which instruments, and how many of each, comprised a brass band. This standarization has remained in effect for over 100 years. Most band performances were outdoors, including those at contests. There was no standard arrangement of the players, but all bands stood either in a circle or square with the conductor in the middle. In the square formation the principal soloists (cornet, soprano cornet, tenor horn and euphonium) each occupied a �corner� of the square. This became the origin of the term 'corner men' when describing the leading players of a band. Contesting became the prime reason for existing for many bands. Contesting provided opportunities for travel, meeting other bandsmen, and measuring individual and group progress. Many of the historical photographs of brass bands in British Columbia show bands that include clarinets or flutes/piccolos. For many years I interpreted this in one of two ways. The group is not correctly named. The term brass band is used by the uninitiated to mean all manner of ensemble that include brass instruments. Perhaps the group is a wind and reed concert band but have been called a brass band by the photographer. The inclusion of a clarinet or flute inplies that the band is transforming into a concert band. 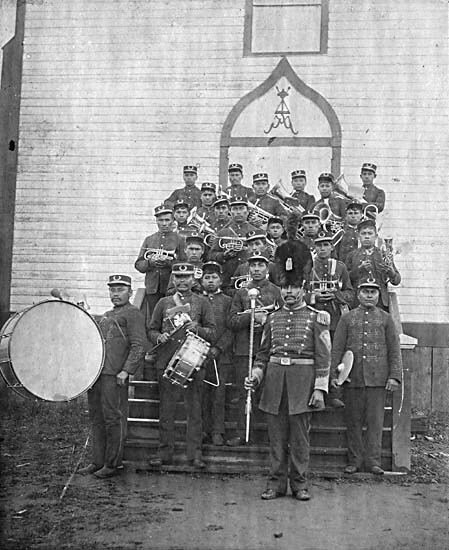 Over time the number of reed instruments would increase, but at the time of the photograph only one or two reed instruments were in the band. But based upon the history of brass bands in Great Britain, the inclusion of a clarinet or piccolo was not uncommon up until the early years of the 1900's. Perhaps the British Columbia photographs are representative of the brass bands of the time and are not mislabelled or transforming to concert bands. Nanaimo Junior Brass Band, ca. 188-. The band shows instrumentation typical of an 1860's British brass band. It includes valve trombones, a piccolo and a clarinet. Revelstoke Independent Band, ca. 1910. Another, much later photograph showing similar instrumentation as the previous photo. Isolation: due to the vast distances between British Columbia and Great Britain, perhaps the British Columbia bands maintained their original instrumentation for a longer period than their British counterparts. This could relate to the cost and time it took to ship instruments and music to British Columbia. In addition, the movement would be isolated from the 'winds of change' that were blowing through the movement in Great Britain. Absence of Contests: contests were few in British Columbia. Given contesting's effect on standardizing instrumentation in Great Britain, perhaps the absence of contests in British Columbia meant there was no incentive to change to a standard all-brass instrumentation.